The rain and birds outside. Anyhoo! Happy Birthday to c2lan today, lithele in a few days, and rsuenaga, babylondonstar, and selie from a few days ago! Click on the preview to see the full comic! Ice cream is tasty in a cone, but not Dole Whip. I am a big fan of pineapple burgers -- and pineapple on pizza too! So sweet and delicious and just plain awesome. Now I am hungry, with not a pineapple to be had. XD! Do they have pineapple burgers locally in your area? Camellia Buffet had some sweet & fresh pineapple chunks as part of their offerings when I went for lunch the other day. Yum! Bwahahahahaha, and stinky ye'll be, me hearties, after a visit aboard th' Camellia Buffet! Lunch is $12.51 per person (with tax). Be sure to grab a handful of peeled garlic from the bin and a steak knife to slice it. Grill and eat for extra stinkiness. I might have to make it a special lunch date one weekend. Have you ever been to Yakiniku Mikawon (I think they changed the name slightly as of late) near the back of Brians? That's another place that piques my curiosity but haven't worked up the guts to go. Nope, haven't been there. If you hop by, post a review! I also hoard containers like crazy... never know when you're going to need that odd-sized/shaped tin!!! I just need more space. Oo~ What scents do you have? I have to be careful of which ones I choose as some trigger my migraines - I'm not sure which ones, but the Yule holiday ones seem okay... I think some of the catalogue ones I have are just too strong. 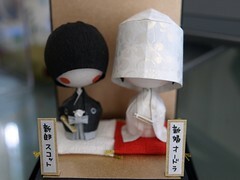 The bride and groom dolls are adorable, as are the tins! What are those stickers from, or did the canisters come like that? 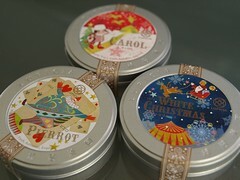 The stickers on the tins are for the holiday edition teas~ I really wish they'd just sell the stickers or illustrations! They're so adorable! Are those chocolate covered strawberries in your icon??? EEEEEEEee!!!! SO CUTE! LUPICIA TINS!! *_* I just went today and got sakuranbo vert ^__^ I love Lupicia. Okay, that does it. I'm going to L&L for lunch today. But no pineapples. ...maybe chicken katsu... Oh! oh! and a spam musubi!